As a Celtics fan and writer, I am always interested in the wanderings of our former stars and the status of the Celtics long-term, West Coast rivals - the Los Angeles Lakers. Even after researching for this article, I have absolutely no idea what I am looking at out West. It starts with the Rondo-Lonzo pairing. 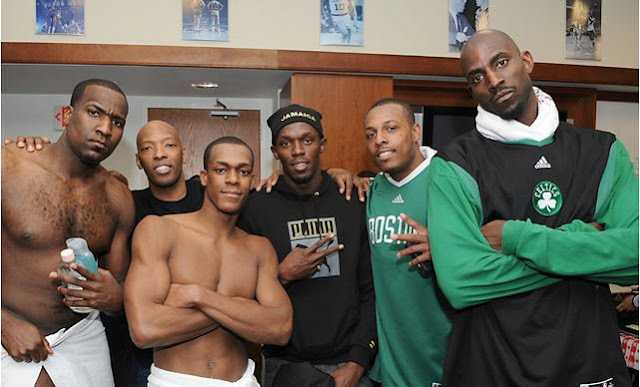 I have always been a Rajon Rondo fan since I saw him in the stadium lobby as a rookie for a pre-season game. He looked like a deer in the headlights. He earned a Championship ring with Boston in 2008 - was a 4X All-Star, 2X All-Defensive First Team, 3X Assist Leader and 1X Steals Leader. He has a 6'9" wingspan and enormous hands. The Lakers will be Rondo's sixth team. Danny Ainge saw the talent in him, and he didn't disappoint. But he is now teamed up with Lonzo Ball, and both are ball-control point guards. And as we know well, LeBron James also likes to control the ball - and the entire game. How is that going to work. It could all be a major disaster, or it could be a very entertaining, and successful season for the Lakers. I won't get into LaVar Ball's part in all this, but what happens if Rondo starts in place of LaVar's son? And how about Lebron not being happy about goofs by Lonzo or perhaps the fact he is not pleased with Rajon's ball-dominance. Another team member, Michael Beasley, is playing for his 11th team - having played for one team, the Miami Heat, three different seasons. He has played all over the world and never seems to land in one spot for too long. Moving right along, JaVale McGee has the unenviable honor of having been named as the only NBA player to be awarded the Shaqtin-a-Fool MVP twice, in addition to receiving Shaquille O'Neal's Lifetime Achievement Award for on-court mishaps. Now we are on to Lance Stevenson. Eight teams in his career - twice with the Pacers. Often charged with defending The King, how does he fit as a teammate? We all remember the Lance-blowing-in-The Kings-ear episode. Only time I have ever seen that by any player, so at least it was innovative. The player who was featured more frequently on the show (Shaqtin-a-Fool) was JaVale McGee, who "won" MVP honors in the first two seasons. However, McGee's growing displeasure over his frequent appearances culminated into a heated argument between him and Shaquille O'Neal on February 24, 2017, with extremely offensive tweets exchanged between the two. During the following show, O'Neal declared that the feud was over and McGee's name would "never come out of his mouth again". Do the Lakers have a lot of talent? You bet! Can they gel? Who knows. The Lonzo/Rondo/Lebron trio presents the biggest question. Three ball-dominant potential starters on the court at the same time will be interesting to watch. And even Rondo has stated that he and Lonzo have very similar skills. We will know shortly how this all works - or doesn't.